The sentiment surrounding the Foster the People mural downtown quickly evolved from somber to celebratory as Mayor Eric Garcetti decided to keep it up rather than tear it down — all thanks to a Change.org petition that acquired almost 12,000 signatures. Instead of hosting an event to “talk about art, music and community” during the removal of the mural, Foster the People encouraged fans on Monday to come to the 125-by-150-foot mural, located at 539 S. Los Angeles St., to meet the band members and have their thoughts on the mural filmed. The first 500 fans received posters of the album cover/mural that the band members then signed. Two touring band members, including Sean Cimino, made an appearance around midday. In regards to the mural unexpectedly staying up, Jacob “Cubbie” Fink — one of the three main members, who plays bass and does backing vocals — was elated. It was obvious that the fanbase was a very devoted one. 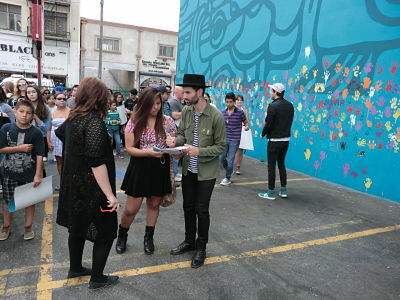 Fans who had signed the petition arrived to meet the band in the morning, hours before any of its members arrived. Zeledon says that she does not feel that the mural is an advertisement because of its similarity to the band’s album cover, and that people who do not know about the band or the album would think it was just normal street art. Alexis Hernandez, 20, a student at Otis College of Art and Design, has been a fan since the band’s first album was released. She found out about the petition via social media, specifically Twitter and Instagram. “I’m so glad [Johanna Maria] created the petition. Without her, I’m pretty sure they would have painted over that mural,” she says. Hernandez views the mural as freedom of expression. “If you read the text on the mural, it says that the money… all the gold… [the model] throws it all up. She throws away all the money and fortune. It’s about the working class and how we work our way through life,” she explains. I ate it all / plastic, diamonds and sugar-coated arsenic / We danced in honey and sea-salt sprinkled laxative / Coral blossomed portraits in Rembrandt light / Cheekbones high and fashionable / Snap! goes the moment / A photograph is time travel / like the light of dead stars painting us with their warm, titanic blood / Parasitic kaleidoscopes and psychotropic glow worms stop me dead in my tracks / Aphids sucking the red off a rose / but for beauty I will gladly feed my life / into the mouths of rainbows / Their technicolor teeth cutting prisms and smiling benevolently / on the pallid hue of the / working class hero. Another fan, Diana Fleak, 16, at Chapparl High School says she has been a fan of Foster the People since they released their first single, “Pumped Up Kicks.” She went to a concert at the mural in January, which she says was free. Fleak agrees that the mural has a positive message. All three fans were aware of the album’s message, having listened to it and read information about it online. They all felt that it was art rather than advertisement and all agreed that the mural would not be there without the massive support of the fans. Hernandez and Zeledon say they are very appreciative of Johanna Maria, the creator of the online petition. At the end of the day, they believe the mural delivers a positive message to those who view it.